It's another eventful (and lost) day for the Donald Drumpf campaign, and another instance of Republicans, ha, ha, not speaking English so good. "There was no animosity between Paul [Manafort] and I," fired campaign manager Corey Lewandowski insisted erroneously (in more ways than one). Why do these anti-immigrant people abuse the rules of grammar so? But back to the floundering Drumpfs. In addition to all the coverage of the Lewandowski sacking, The Washington Post has this handy round-up of the many reasons that Team Trump is in deep political trouble. It's recommended reading all around — as much for the political talking-head class as for the voters (lest the talking heads try to suggest that this simple cosmetic change is the end of the slide). One more thing that struck us today: Numerous reports assert that it was intense lobbying from Trump's adult children that led him to fire Mr. Thug. 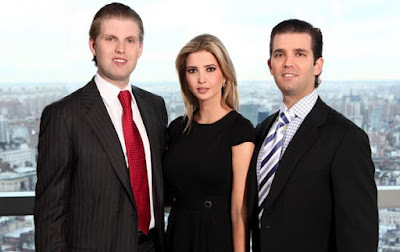 So we guess we're all supposed to assume that aside from himself, when it comes to his Presidential campaign Donald Trump relies most on the political judgment and smarts of Ivanka, Eric and Donald, Jr. Hmmmm: Weren't those the very children who missed the New York state voter registration deadline? Some smarts. We cats PURR.